Today I’m excited to be sharing a bit about the Mocho Loco stationery products that are fun, eclectic and modern, as well as colourful! Moco Locho was started by Vicky in 2009, who is originally from Buenos Aires. Mocho Loco was mainly specialising in branding and illustration, but this range of stationery recently launched and I LOVE it! I’ve got a few things from the Confetti and Home Flora ranges to show you today! Everything is designed and printed right here in Cape Town, too! 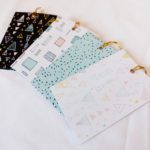 The notebooks are fun and colourful with wonderful prints and patterns on the covers and just the right amount of paper. I simply love confetti and geometric shapes and these are used so beautifully in this particular range. The pastel colours are also lovely. The paper inside is quite thick, too. (These notebooks come in a pack of three). 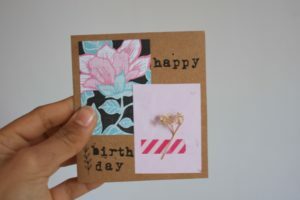 The greeting cards are colourful and vibrant, as well as versatile, as they can be used for any occasion. The Home Flora cards are especially versatile because the can be used for anyone. I love the modern use of plants on these cards. They also come with a brown paper envelope. The confetti greeting card is a really cute size and I love the pretty little envelope it comes with. The gift tags are SO cute. They are such a lovely size, and they, too, are extremely versatile. I used one of my gift tags in one of my scrapbooking layouts. There are SO many purposes for gift tags, it’s almost crazy! They can be used in journals and planners, (obviously) on gifts, in scrapbooks and I sometimes even use gift tags as bookmarks. These are such wonderful little things. They are made out of veneer wood and they are perfect for popping in cupcakes at any party. They are easy on the environment too, as you can reuse them many times. All you have to do is wipe them off when you’re done using them. They’re so pretty and very sturdy. I also used one of mine in a plant that lives in my room! I simply love these bright, fresh and funky products! If you love any of these things, you can find them all and more on the Mocho Loco website. You can never have too much stationery and these fun ranges are sure to brighten up your workspace as we head into the heart of winter! I hope you are enjoying these Made in SA posts. I have a few more planned! Art Journal Peeks / 01. It’s been a while since I’ve written here. I’ve been so busy, juggling tests, school functions and now, exams! I can barely contain my excitement for Kamers Vol Geskenke. It’s happening at the moment in Cape Town, at the Castle of Good Hope and I’m visiting it over this weekend. It’s a massive show with only handmade and crafted things. Sounds amazing, right? Anyways, I wanted to keep posting my journaling though. I’ve taken some shots of a few of the latest pages in my journal. I hope you enjoy flipping through the pictures. Uh, yes, my cactus obsession is real. I was using a few watercolour prompts as journaling prompts. Playing around with different fonts, pens and brushes on the left. This is probably my favourite page in my current journal. The quote on the left I found in Big Magic by Elizabeth Gilbert and I L.O.V.E it! The page on the right was inspired by a rainy day, as you’ve probably sussed out. I love the right page. I did it by using the straw technique. Just make your watercolours quite wet and drop it on. Then, whilst its still wet, blow it with a straw and watch the colours take over your page! Botanical prints and patterns are something I’ve been on the look out for and I’ve been experimenting a lot. I made this paper by using the straw technique too. As you can see, my journal is getting really full! Have a fabulous weekend! Good luck to everyone writing exams at the moment! Keep warm, Southern Hemisphere peeps. A little while ago, I wrote a post about my midori journal and it was quite popular, so I decided to go into a bit more depth as to how I journal. 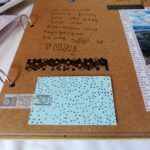 Lately, my favourite method of crafting has been, well, journaling. I’ve been experimenting with different forms of art journaling, collaging and midori-style journaling. This is the Midori I’ve been using. It’s A5 size and was custom-made for me. I love it! This is the notebook I’ve been using. I kinda love the cover. I’ve also been playing around and trying to make my own inserts for my midori. This one turned out pretty cute I think. I keep a box of scraps of card and paper to use for layering up my journal. I use normal notebooks from the grocery store so the paper isn’t very thick, that’s why I prefer to layer. Here’s some step-by-step shots of how a spread come about in my journal. I started off by layering with the paper I wanted. Next, I added washi tape and some stamping for my heading. Then I added some more stamping, as bullet-points and a decorative border at the bottom. I love that hexagonal stamp! Its an acrylic stamp from the Docrafts Papermania Geometric Mono range. LOVE. This is how it turned out. I really like doing these kinds of things. They make me think and reflect a bit, you know? But believe me, some of my journaling pages are VERY impulsive. I’ve also been painting, L.O.T.S. Watercolours are my absolute favourite medium at the moment. So easy to use, fast-drying, no smell and quick clean-up. Its a joy! Lastly, I thought I’d share a shot of my desk. I don’t usually share pictures of my workspace because I do most of the shoots for these posts in our patio room because of the divine natural light. But I thought it was about time. I could go on, but those are the ones that came to mind. Lastly, I visited Decorex Cape Town last week and it was amazing. I came back feeling inspired and so in love with home decor. Don’t forget to spoil your mums for Mothers Day on Sunday! And if you are a mum, I’m sure you’ll get spoilt x. One of my new year’s resolutions (even although I don’t fully agree with only making fresh starts in a new year) for 2016 is to carefully plan and curate my inspiration and ideas into output as creative projects. More often than not, ideas stay at just that. Ideas. Because inspiration isn’t organized meaningfully, its hard to use it constructively. Step 3: Stamp your cover. (You can decorate it however you like). I know it’s really simple to make, but its so great for storing anything from quick ideas to magazine clippings and polaroid print-outs. Hey there! Lately scrap-booking and card-making have been my form of escapism. I use a variety of supplies when creating my cards. Some of them include stamps, watercolours, papers, pens, and stickers. Another one of my favourite techniques is stamping. It’s easy, fun and if done properly can, it can look beautiful! Use mixed media! Don't think because you've used a matte paper that you can't use a glossy one! Or because you've used stamping you can't use stickers! 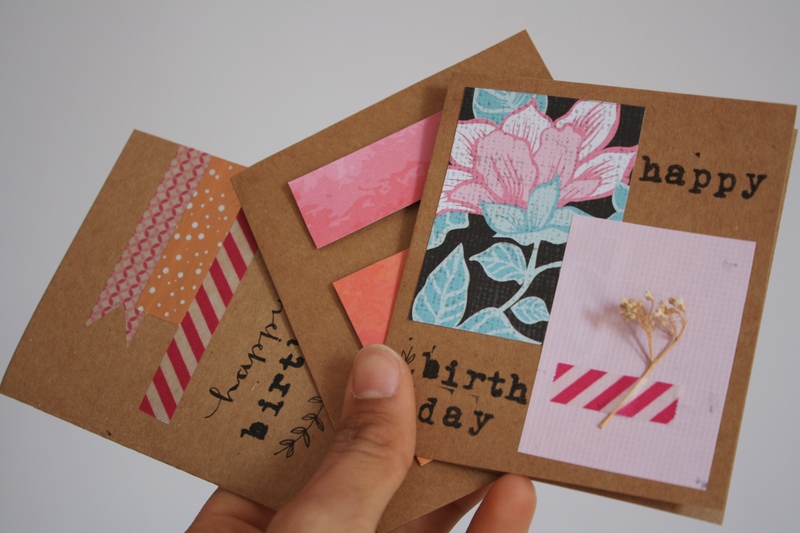 Mixing and matching is key in creating an attractive card! 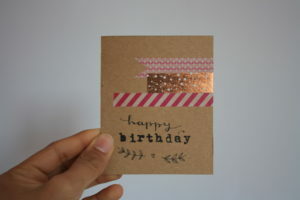 cardstock, washi tape and stamping. 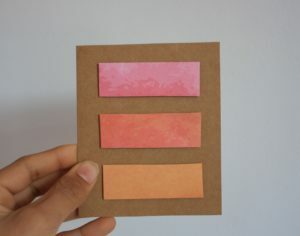 And last of all, some colour inspiration! Never be afraid to use colour! Use all those tips and tricks and voila! I hope these tips were helpful! Be sure to try some card-making yourself!